The battle over Parliament’s say in the Brexit process between MPs, peers and ministers resumes in the Lords later. Peers will vote on an amendment forcing ministers to consult Parliament in the event of there being no deal. Theresa May avoided defeat on the issue last week but rebels say concessions made by Downing Street are “valueless”. MPs overturned a series of changes to the EU Withdrawal Bill made by peers and now the Upper Chamber must decide whether to give way or stand firm. A dozen or so Tory MPs, led by former attorney general Dominic Grieve, want a bigger role for Parliament, should a final Brexit deal be rejected by MPs or if no deal is reached – the so-called “meaningful vote”. After two days of talks last week, Mr Grieve said a government amendment drawn up to avert a rebellion was changed at the last minute and that he and his colleagues would not back down. He has drafted his own amendment to the legislation – which would require ministers to report to Parliament if no deal was in place by the end of November and allow MPs to vote on what to do next – will be considered by peers later when it is tabled by the ex-cabinet minister Lord Hailsham. The amendment – which may have changed before coming before the Lords – set out what should happen in three different scenarios. 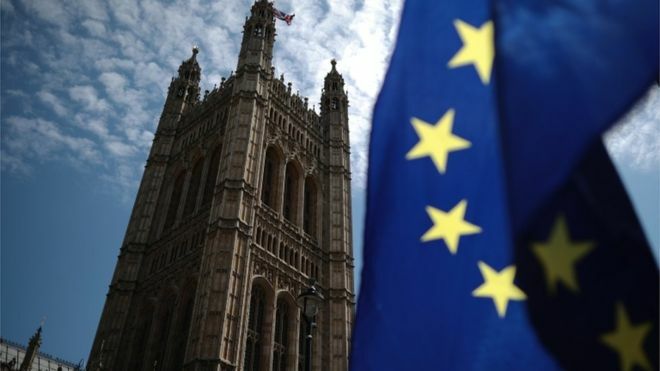 If MPs reject the Brexit deal, ministers must make a statement within four weeks, with a Commons vote to follow on the government’s proposed approach. If no withdrawal agreement is reached by the end of November 2018 – MPs will get to vote on a government motion setting out its proposed course of action. If no withdrawal agreement is reached by 15 February 2019, within five days the government must bring a motion in front of MPs and follow any direction to negotiations voted on by MPs and debated by the Lords. The BBC’s parliamentary correspondent Mark D’Arcy said it was likely to be approved, given the previous version of the amendment passed by 91 votes. Mr Grieve warned on Sunday that Tory rebels could potentially “collapse the government” if they were denied a real say on the prospect of the UK leaving the EU without an agreement. He told BBC One’s Sunday Politics he thought both sides had agreed MPs could have an “advisory” vote, that would not order the government to do anything, but would help people to “keep calm”. He said he was not prepared to sign up to a position where the UK risked going “over the edge of a cliff” without Parliament expressing its view. “I’m absolutely sure that the group is quite determined that the meaningful vote pledge, which was given to us, has got to be fulfilled,” he said. Rebels had originally wanted the amendment to say that the government must seek the approval of Parliament for its course of action – and that ministers must be directed by MPs and peers. The government says the whole row is about a “hypothetical” scenario and it expects to come back with a good deal in the autumn that Parliament will support. Conservative MP Anne-Marie Trevelyan said she was “distinctly uncomfortable” about the way in which she said Mr Grieve was “pushing this to the limit”. Asked on the BBC’s Daily Politics whether she believed her colleague was seeking to block Brexit, she replied “it is starting to feel a bit like that”. The MP, who campaigned to leave in the 2016 referendum, said the prime minister “needed the right tools” to take the UK out of the EU in accordance with the wishes of the British people. The main purpose of the EU Withdrawal Bill is to end the supremacy of EU law in the UK, and transfer existing EU law into UK law so the same rules and regulations apply on the day after Brexit. On Monday, peers will vote on a number of “compromise” amendments tabled by ministers in response to 15 defeats inflicted on them in the House of Lords. These include on customs arrangements after Brexit, the status of the Northern Ireland border and whether to include the exact date of Brexit – 29 March 2019 – in the legislation.